In the last few months, we’ve seen all sorts of proposals from states trying to keep their transportation budgets solvent. But here’s a new one — the pointless bike tax. Lawmakers in Washington state have proposed a $10 billion transportation spending package that will raise gas taxes and vehicle registration fees. In addition, the draft transportation bill includes what local media are calling a “symbolic” tax on bicycles. 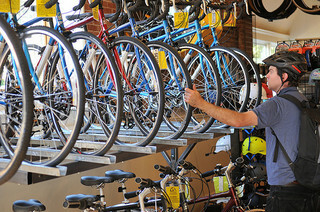 The package’s proposed bike excise tax ($25 on sales of bikes costing more than $500) would harm hard-working small business owners. Most such bikes are sold by small family-owned bike shops and this would impose red tape and costs for them while creating virtually no revenue. People who bicycle already pay substantial taxes for our transportation system, including the sales taxes, property taxes and federal taxes that together cover two-thirds of all transportation spending in Washington. Bicyclists who own cars also pay the same car tabs as everyone else even if they drive less. A $25 tax is 4% of the value of an entry level $600 bicycle. Compare that against the 0.3% excise tax on new car and truck purchases. Both are on top of the 6.5% state sales tax and whatever local sales taxes that might apply. That’s a full magnitude of difference. Meanwhile, Jonathan Maus at Bike Portland writes the idea of a bike tax has been tossed around in Oregon for a long time and it wouldn’t surprise him if it emerges in budget negotiations there as well. In the past, some Oregon bike advocates have supported such proposals, under the notion that it would help allay the perception — no matter how inaccurate — that cyclists don’t pay for roads. Elsewhere on the Network today: Urban Review STL shows a great example from St. Louis of how a former gas station can be transformed into a truly lovable urban space. The Fast Lane shares U.S. DOT’s plan to make the nation’s national parks more accessible by transit. And Transportation for America writes that the latest standoff in Washington over the budget “sequester” threatens to be very bad news for the transportation programs that are most popular in local communities.